Skull logo on receiver. 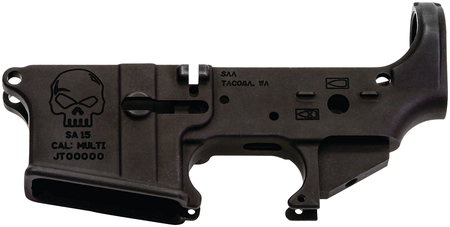 Forged, mil-spec stripped lower receiver for semi-auto AR15. Works with standard AR15 components and magazines. Mil-spec dimensions and coating on receiver. Pictograms for fire control. Machined from 075-T6 forged aluminum with matte black hardcoat anodized Type III Class 2 finish. Multi-caliber designation. Made in the USA.